A young man leaves Japan for the United States. 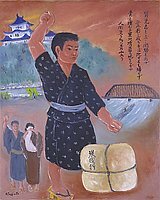 Focal point is a young man dressed in knee-length dark yukata with white design, blue obi and yellow geta standing with right arm raised and hands clenched. He gazes off to the right of viewer. 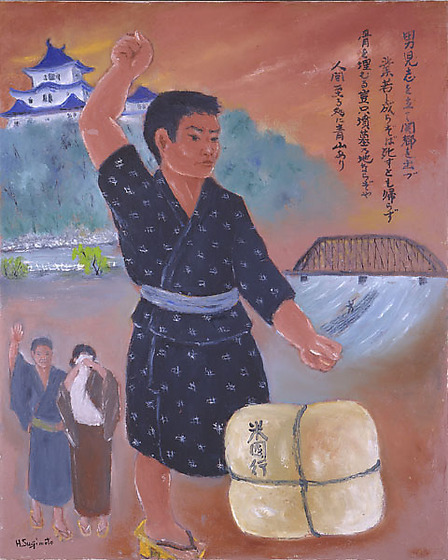 Labeled "Beikoku yuki" (Going to America) in the upper left corner, a white bundle tied with rope sits at his feet. In the lower left, a man in a grey yukata and geta raises his hand in farewell while a woman in brown covers her face with a white cloth. In the upper left background Wakayama Castle resides at the top of a green hill with a river, Ki no Kawa, at its base. Midground right, a large bridge stands as a large wave passes under it, a figure is visible in water. Above it, four lines of a Japanese poem on reddish background. Some sixty years after leaving Japan, Sugimoto completed a series of paintings meant to document and interpret the history of Japanese immigrants in the United States. This work, no doubt inspired by his own experience, portrays a young man leaving Japan for the United States.